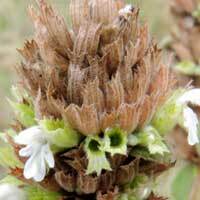 Observed on flowering/fruiting spikes of spurflower, Plectranthus. Menangai Crater, Nakuru, Kenya. March 2013. From Wikipedia: Pentatomidae, Greek pente meaning five and tomos meaning section, is a family of insects belonging to order Hemiptera including some of the stink bugs and shield bugs. The body is , green or brown color, usually trapezoidal in shape, giving this family the name "shield bug". The tarsi are 3-segmented. The forewings of stink bugs are called hemelytra, with the basal half thickened while the apex is membranous (as are the hindwings). 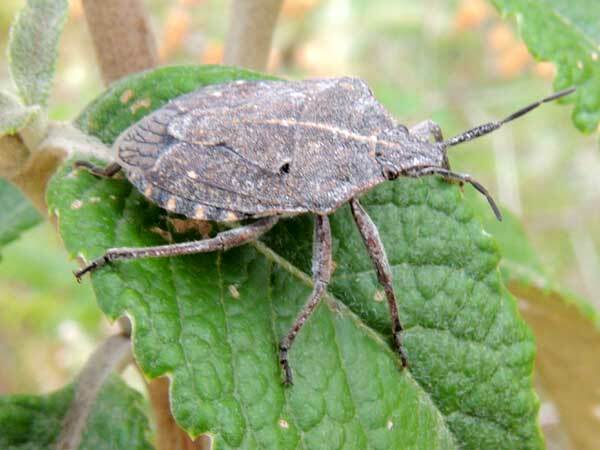 The stink bug, also called stinkbug, derives its name from its tendency to eject a foul smelling glandular substance secreted from pores in the thorax when disturbed; in some species the liquid contains cyanide compounds with a rancid almond scent. This is a form of antipredator adaptation. Copyright Michael J. Plagens. Page created 26 August 2013.